Detention-reform advocates draw responses from Democratic candidates to a growing protest that began on Thanksgiving. Immigration activists brought the current fight over immigrant detention to Hillary Clinton’s doorstep Thursday. Two dozen activists protested outside Clinton’s Brooklyn headquarters to push the Democratic presidential front-runner and Bernie Sanders to respond to #Freedomgiving—the name activists gave to a week-long hunger strike that began the day before Thanksgiving and is currently being waged by more than 100 asylum seekers who are held in at least six detention centers across the country. 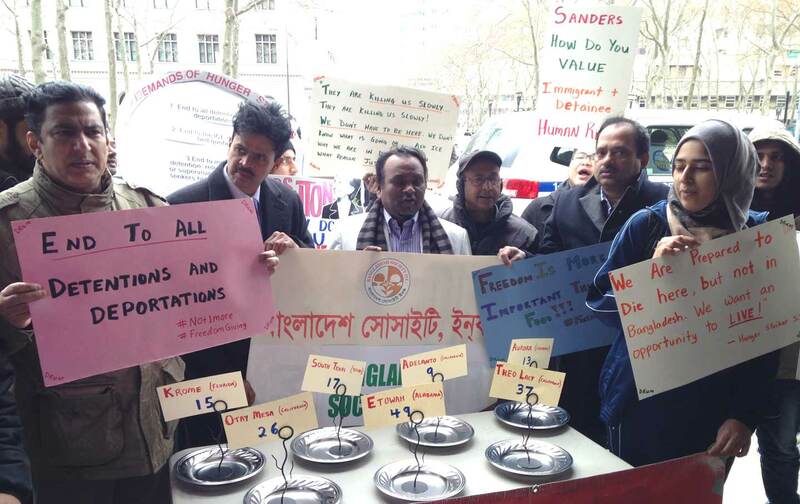 According to Desis Rising Up and Moving (DRUM), the New York City–based group that has helped amplify strikers’ demands beyond the detention walls, more than 150 detainees are currently on hunger strike, including 14 detainees at Krome Detention Center in Florida who joined the protest on December 2. Roughly two-thirds of the strikers are from Bangladesh, Afghanistan, Nepal, or India, and the other third are from Ghana, Togo, Burkina Faso, Ethiopia, and Nigeria, according to DRUM’s executive director Fahd Ahmed. Every one of the strikers fled the threat of retaliation and persecution in their home countries, Ahmed says, and entered the country via a port of entry at the US-Mexico border in the hopes of being granted asylum. As of Thursday, Immigration and Customs Enforcement’s (ICE) own tally of hunger strikers stood at 109: 43 detainees at Etowah Detention Center in Alabama; 35 at Theo Lacy Immigration Detention Facility in California; 13 at Otay Mesa Detention Center, also in California; 11 at Denver Contract Detention Facility in Colorado; six at the South Texas Detention Center; and one at the Orange County jail in New York. DRUM and ICE’s numbers are different, at the very least due to how ICE classifies hunger-strike participation. ICE considers a person to be on hunger strike only when they’ve refused or missed nine consecutive meals. Lorella Praeli, director of Latino outreach for Clinton, came outside and listened to the protesters as former detainees read statements about their time in detention and activists called for reform of the country’s immigrant detention system. Arturo Carmona, Praeli’s counterpart in the Sanders campaign, released a statement of support for the hunger strike just as the New York City action got under way. This latest string of hunger strikes is just the latest coordinated action to call attention to ICE’s detention policies. Last spring, 37 detainees, many of them South Asian asylum applicants, went on a hunger strike at the El Paso Processing Center, protesting similar indefinite stays and detention conditions. In October of this year, another 54 detainees, also from South Asia, did the same. The U.S. detained 85,000 people in 1995, but by 2013, the annual count was more than 440,000. The US immigrant detention system has ballooned in recent years, reaching record highs during President Obama’s tenure. The United States detained 85,000 people in 1995, but by 2013, the annual count was more than 440,000. Congress has all but mandated that growth with legislative language that calls on ICE to “maintain a level not less than 34,000 detention beds” on a daily basis, which is widely interpreted as a detention quota. Despite efforts from the Obama administration to reform the immigrant detention system, complaints of mistreatment and policy violations continue. And so do the hunger strikes. But Rumon Ahmed, a detainee from Bangladesh currently being held at Etowah Detention Center, disputes that claim. Ahmed was brought to a hospital after four days of striking and he was forcibly catheterized by hospital staff—“in order to torture me,” Ahmed (no relation to Fahd Ahmed) says in recorded audio that was released and translated by DRUM. Cox said that due to medical privacy rules he could not comment on Ahmed’s medical care, adding that detention centers employ full-time medical staff who provide “necessary and appropriate care” to detainees. Among the protesters outside Clinton’s office on Thursday was Ali Hosen Sohel, a 28-year-old man from Bangladesh who fled his hometown after seeing political colleagues of his kidnapped, arrested, and even killed. Sohel was affiliated with his local committee of the current opposition party in Bangladesh and said he’d be subjected to reprisal should he be forced to return. To underscore the desperation that forced him to flee, Sohel recited the list of countries he traveled through to make it to the United States, first flying from Bangladesh to Trinidad, and from there to Guyana. From there, Sohel traveled by bus, car, and foot through Brazil, Venezuela, Colombia, Panama, Costa Rica, Nicaragua, Honduras, El Salvador, and Guatemala, before finally crossing through Mexico and into the United States at a port of entry in El Paso, where he was detained. Sohel was held for 10 months this year before he took part in a hunger strike in October, after which he was promptly paroled. Still, he says, his asylum application was denied, and he awaits likely deportation to Bangladesh. Sanders has also pledged to close privately run detention facilities, and last week released his immigration-reform platform, in which he promised to push Congress to end its detention-bed quota. “These aspiring Americans should not be criminalized, subjected to dehumanizing solitary confinement, or indefinitely detained,” said Carmona, Sanders’s director of Latino outreach.